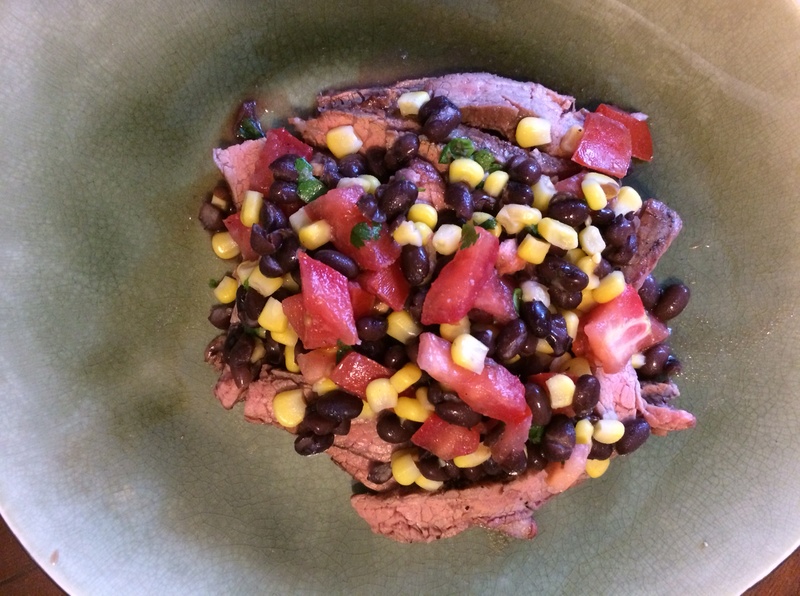 Grilled Flank Steak with Corn, Tomato, and Black Bean Salad | Om nom nom! This was a very tasty and quick grilled meal that definitely made a few leftovers – always nice. I used Skinnytaste’s seasoning on the steak, and went to my go-to corn and black bean salad recipe, which you can find here (though leave out the Cojita and olive oil for this). Steak was great as is, wouldn’t change anything. It’s not as low carb as it could be, with the corn and the beans, but they’re mostly useful carbs which I don’t tend to worry about too much. Even on a lower carb diet, I’d make again. You could serve this with a green veggie on the side, but it was plenty filling on its own! Season steak with the crushed garlic, cumin, salt and pepper and set aside 5-10 minutes. Grill 5-7 minutes on each side, or until desired degree of doneness (I like medium-rare). Remove from grill and let rest about 10 minutes, then slice *very* thinly. Top slices with corn and black bean salad and serve.